Skylanders Trap Team, this year’s eagarly awaited entry into the popular Skylanders action figure/video game hybrid franchise, will also be released for play on iOS and Android tablets, Activision announced today. In the coming game, you’re tasked with collecting virtual bad guys inside of physical real-world traps. The captured baddies act like Pokémon – you capture them and then use them to fight battles for you inside the game. Skylanders action figures can be placed alongside the traps, creating a tag team element in the game. 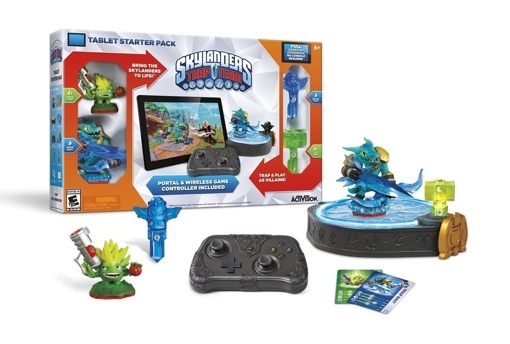 The Skylanders Trap Team Tablet Starter Pack includes the full game (download required), a Bluetooth “Traptanium Portal” that acts as a tablet dock and a Bluetooth game controller. It also includes two Skylander action figures and two traps. As always, additional figures and traps can be purchased and added into the gameplay experience. The Skylanders Trap Team Starter Pack for iOS and Android is slated for an October 5, 2014 release. The game will also be available on the PlayStation 3, PlayStation 4, Xbox 360, Xbox One, Nintendo 3DS and Wii U game consoles. You can pre-order the game set on Amazon.com for $74.99.